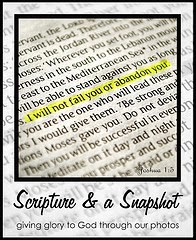 Joining my friend Jennifer at A Glimpse of Our Life for Sunday's Blog Hop called Scripture and a Snapshot. Do yourself a favor and click through to see some lovely, lovely shots from other bloggers across the Web! Beautiful pictures! I love the close-up perspectives.